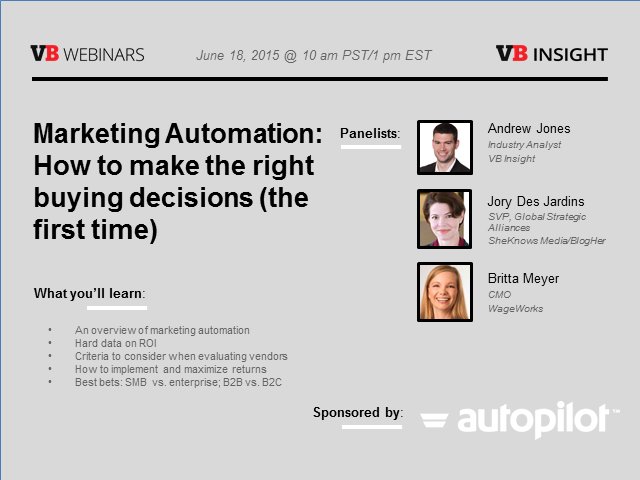 This webinar will be based on Andrew Jones' VB Insight report, published May 5, 2015. Fundamentally, marketing automation refers to software designed for marketing departments to automate repetitive tasks. It helps identify, qualify, convert, and grow (up/cross-sell) customers by delivering relevant messages across channels. And it’s no longer just for B2B companies. Only 5% of businesses are currently using this technology today, yet those that do are generating outsized leads, conversions, and revenue. *Delivers value: 80% of MAP users see their leads increase, and 77% see conversions increase. *Is hard to choose: The top challenge in vendor-selection is simply understanding the differences in functionality between them. *Isn’t easy to implement: Only 29% said they had no issues or delays in getting results. Avoid the pitfalls your peers have already dealt with. Understand the opportunity value and how to get ahead fast. This research includes data from 243 marketing automation users and details on features, pricing, and services on 24 of the top vendors. We also conducted dozens of interviews and incorporated market share from data partners who spider close to 20 million websites.